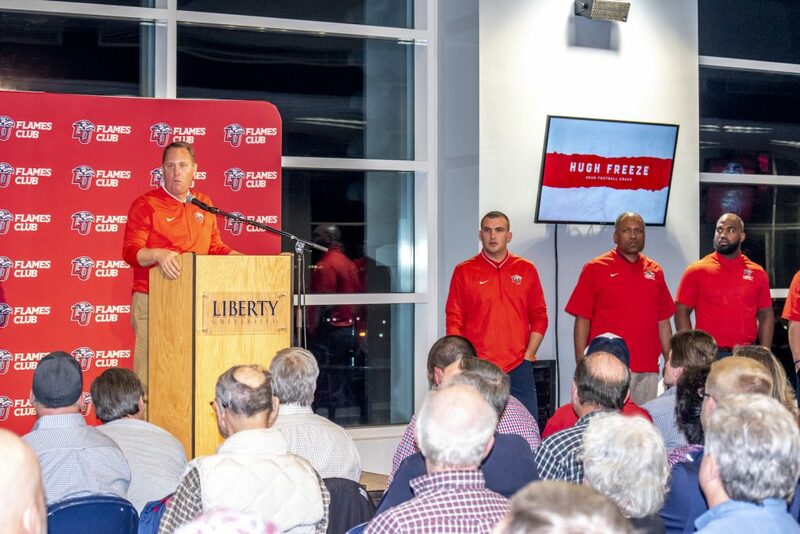 The Liberty Flames welcomed in a new era for their football team Wednesday, Feb. 6. Inside the Carter Tower and in front of hundreds of dining boosters, the Flames formally introduced new Head Coach Hugh Freeze, who along with the rest of his staff, set the expectations for the 2019 season. Freeze was especially optimistic about his team as they move closer to the opening of the season. Freeze introduced his revamped coaching staff, which includes two people who have played under or worked with him in the past. This includes tight ends coach Ben Aigamaua and co-offensive coordinator and wide receivers coach Maurice Harris. Aigamaua, who played defensive tackle at Lambuth University from 2006-09, played under Freeze in his last two seasons at Lambuth and is particularly excited to be reunited with his former coach. The rest of Freeze’s staff has plenty of experience coaching in other leagues. Kent Austin, who has coached for 30 years prior to Liberty, will serve as the quarterbacks coach and co-offensive coordinator with Aigamaua. Austin won four Grey Cup Finals (the Canadian version of the Super Bowl) in the Canadian Football league in 10 years. Austin will be in charge of elevating Liberty’s incumbent quarterback Steven “Buckshot” Calvert to the next level of play. Calvert, who is entering his senior season, threw for 3,068 yards and 21 touchdowns last year. STRONG GREETINGS— The Flames Club and Liberty Athletic Department welcomed Liberty’s new football head coach Hugh Freeze Wednesday, Feb. 6. In addition to being the day where Freeze and his staff were formally introduced, Feb. 6 was also national signing day. The primary focus for the Flames recruiting staff was shoring up their defensive line with athleticism and size, and the Flames made good on their promise by signing six defensive linemen. That group included 6-foot-6-inch, 315-pound defensive tackle William Green, whom defensive line coach Josh Aldridge was particularly excited about despite Green’s lack of experience. It was a night full of optimism, with many personal stories, laughs and memories shared by the coaching staff. Freeze closed out the night by applauding the coaching staff for their work on the recruitment trail and putting together a team ready to play in the fall. “You can rest assured that the staff you have here will work tirelessly to put product on the field that gives you some of those giddy moments,” Freeze said. The Flames spring schedule will begin Feb. 23 with the team’s first practice and will culminate with the annual spring football game March 30 at Williams Stadium. Their first regular season game will be Aug. 31 against Syracuse (ranked 15 in the preseason), and they will be the first Power 5 school to visit Lynchburg.